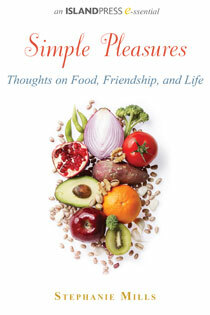 In Simple Pleasures: Thoughts on Food, Friendship, and Life we have highlighted two chapters from Stephanie Mill’s reflection the pleasures, as well as the virtues and difficulties, of a perhaps simpler than average North American life. It is a thoughtful paean to living, like Thoreau, a deliberate life. Mill’s writing is beautifully crafted, fluid, inspiring, and enlightening, and these chapters encourage you to take a moment to reflect on your own life. It celebrates the pleasures, beauty, and fulfillment of a simple life, a goal well worth striving for. "Stephanie Mills is a woman I listen to with great respect. Her life is her art. Her words are a courageous offering of love gleaned through a personal commitment toward social change." "...a welcome antidote, an eloquent tale of one woman's quest for a simple existence." "...clear and simple language, along with much beautifully phrased wisdom."